The building of SFMOMA’s newly expanded site, designed by renowned architecture firm Snøhetta, seamlessly integrates the museum’s existing Mario Botta–designed building, which debuted in 1995 and was completely renovated during the expansion. The new museum is an outward-looking and engaging gathering space, connecting to the surrounding neighborhood through new pedestrian pathways and entrances, and bringing the outdoors into the museum spaces. 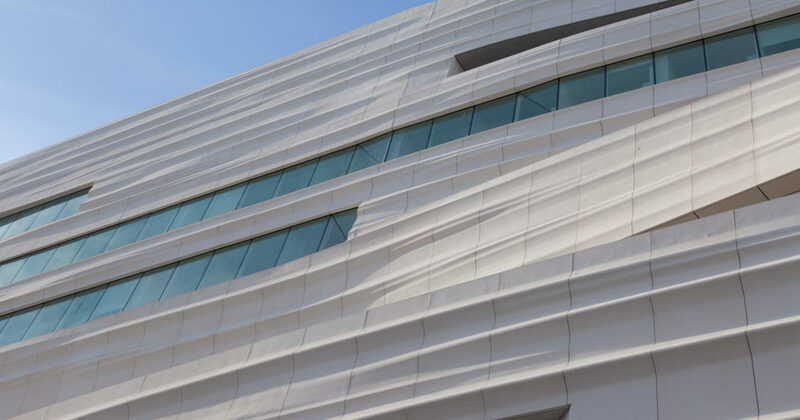 The expansion’s façade was inspired by the waters and fog of the San Francisco Bay, and throughout the day, the movement of light and shadow naturally animates its rippled surface. Inside the museum, daylight floods the staircases and gallery landings; outdoor terraces and gardens offer reinvigorating fresh air and urban vistas.